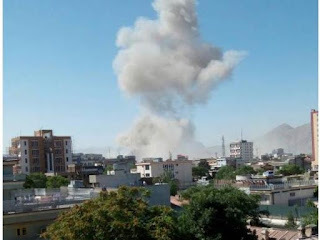 Kabul [Afghanistan]: A heavy explosion in Afghanistan capital Kabul has claimed the lives of at least 65 people and left 325 wounded so far, local media reports said. The massive explosion occurred in the diplomatic enclave of Kabul on Wednesday morning. India's Ambassador to Afghanistan Manpreet Vohra told "Massive VBIED (Vehicle-borne improvised explosive device) not too far from our Embassy. Buildings, including ours, suffered considerable breakages, but all our staff are safe."